Visit Alamo Concrete Pavers for all you paving needs! Take the time to do a little research to make sure your project is a complete success. Examine all of Alamo Concrete's various paving stone shapes, colors, and textures at Alamo Concrete's display. Check out our brochures and display photos of paving stone patterns, then select the style of stone and pattern you prefer. Consult with Alamo Concrete's customer service as to availability and timing of delivery. Set a tentative date for your project. Make a list of the tools you'll need. And enlist a friend or two to help or use a qualified contractor. The depth of excavation will depend upon your project and soil conditions. Determine the excavation by adding together the recommended depth of the base material, the setting bed and the paver thickness. Make sure your plan includes sloping the area for proper drainage. A minimum slope of 2" per 10' is required to carry water away from the house foundations and to prevent water from standing on the surface. After excavation spread base material uniformly throughout the excavated area with a rake. Using the vibrating tamper, compact the entire area evenly. Compact the base material in layers of more than 4". A simple and accurate way to establish final grading and a good setting bed is to use a process known as screeding. Use screeding rails of approximately 25mm diameter or thickness. Pipe is ideal as it provides the necessary rigidity. Set the rails on the base. Spread the bedding sand around and between the rails. Use a 2X4 supported by the rails to screed the sand. Begin placing the pavers on the screeded bed in the pattern you selected. Start slowly. Once you get the rhythm, placing the pavers in the pattern will become easy. It's best to start at an edge or 90 degree corner. This will provide a straight line and reduce the need for cutting stones. Most paver shapes are manufactured with spacer bars on the sides to insure minimum width joints. To ensure good color distribution, work off several bundles of pavers, removing pavers in stacks rather than by layer. Do not step on the edges of the newly installed pavers as this may cause pavers to tilt or sink unevenly. Edge restraint is required on all paving stone installations. 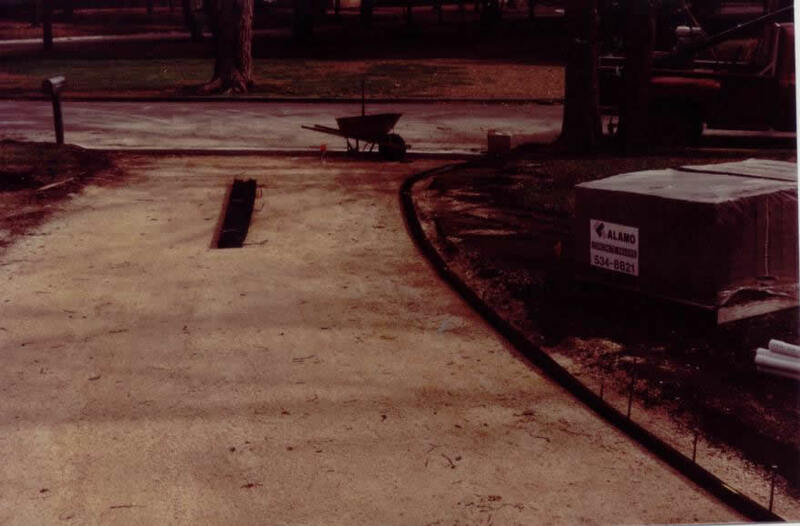 The edge restraint becomes invisible when backfilled with grass or garden plantings. Edge restraints must be installed on the same compacted base as the pavers. 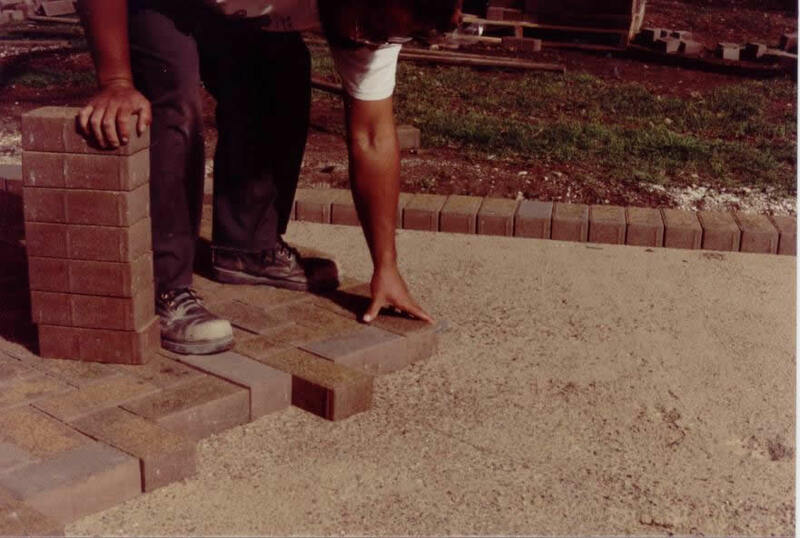 IT doesn't matter whether the edge restraint is installed before or after the pavers are laid, although it is often placed first to serve as a starting edge. Sweep the surface to remove debris which could mar the surface of the pavers. Now use the vibrating compactor. Any small irregularities in paver height caused during the laying process will now be leveled out. 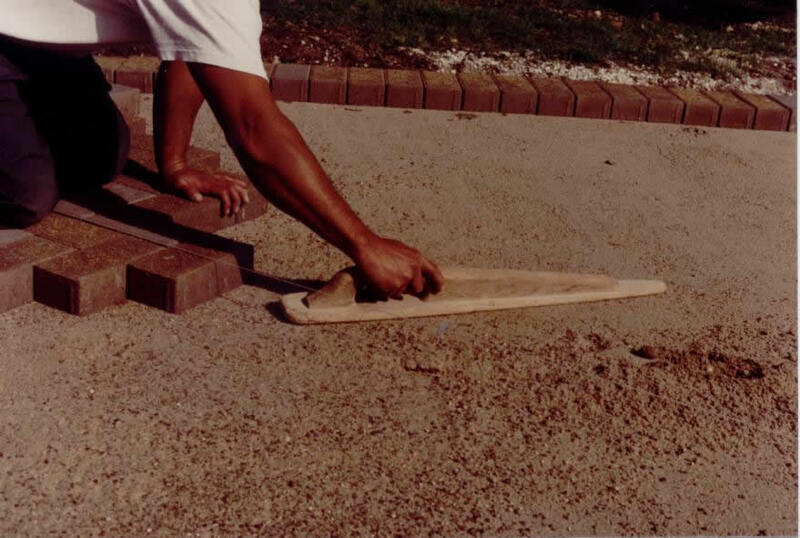 Jointing sand is then swept thoroughly over the surface. 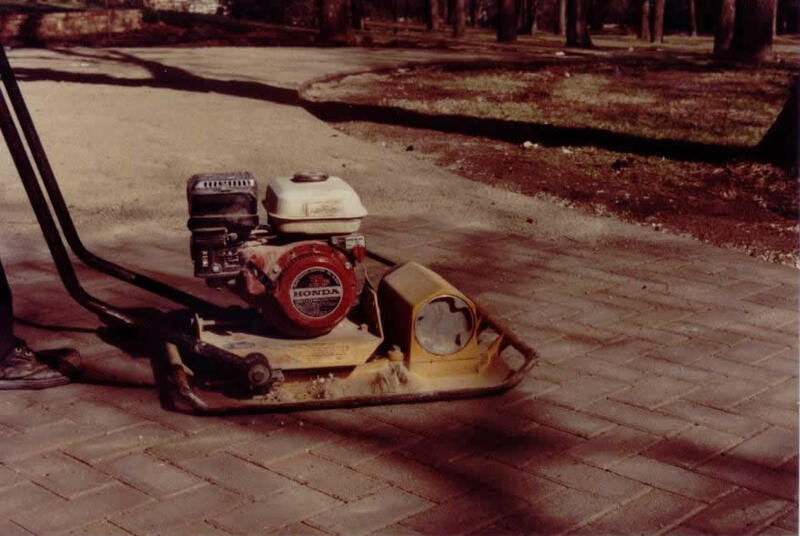 Alamo Concrete pavers are manufactured to withstand freeze/ thaw cycles, water, de-icing salts and automobile drippings. A sealer, applied after paver installation, may enhance color and appearance or make clean-up easier. Use only cleaners and sealers specifically formulated for concrete pavers.